It’s the game we’ve all been waiting for. Well, not really, but it is the long awaited return of Linsanity to the Mecca, the arena where Jeremy Lin became a house hold name practically overnight. Lin has struggled mightily this season though, averaging less than 11 points and 6 assists per game, to go along with his abysmal field-goal percentage (under 40%). The backcourt tandem of Lin and Harden has been questioned because of their styles of play and has left many wondering if they don’t click well. It hasn’t effected James Harden however, as he is averaging 25 points per game, the fifth most in the league. This game is a lot bigger for the Knicks then Jeremy Lin’s return, as they should have some revenge on their mind. The last time these two teams got together the Knicks got ran out of the gym, giving up 131 points to the Rockets in Houston en route to a 28-point blowout, by far the Knicks worst defeat of the year. In that game Harden had 33 and Chandler Parsons added 31, and in the wise words of Bart Scott, the Knicks couldn’t stop a nose bleed. 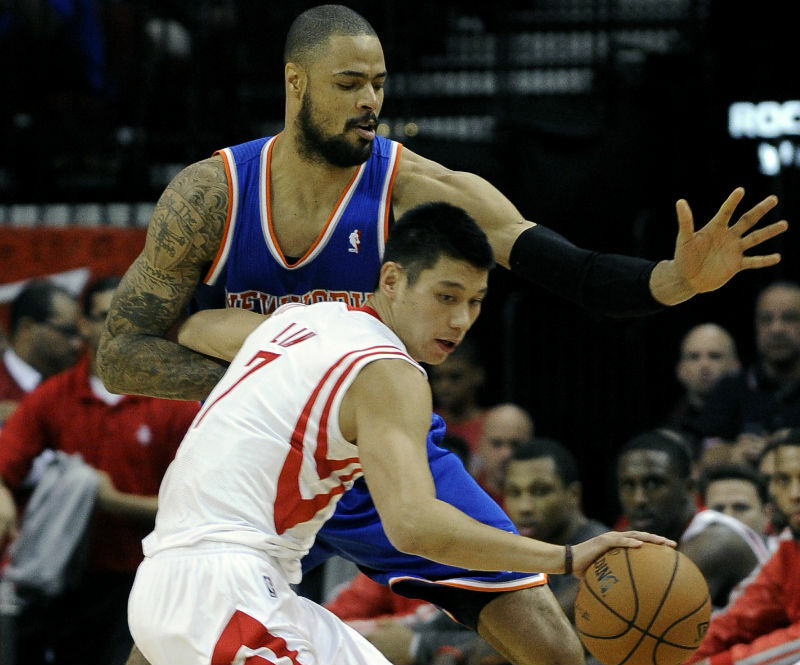 The Rockets knocked down 14 of 25 threes, something the Knicks cannot allow to happen again. The Knicks have gone 10-2 since that game, and have allowed 100 points in only four of those last 12 games. Their three-point shooting and lack of turnovers has been the catalyst all season, and could be tonight as well. The Rockets allow opponents to shoot 38.9% from behind the arc, the fourth highest in the league according to HoopData.com. The Knicks shoot over 40% from downtown and lead the league in 3-point rate. The Rockets are just behind the Knicks in 3-point rate, so be prepared to see a lot of three-pointers tonight from both teams. With Carmelo Anthony questionable with a sprained ankle, the three-point shot will again be huge for the Knicks. Both Harden and Lin like to get out in transition, so the Knicks transition defense will be crucial tonight. The Rockets average 16.8 fast break points a game, and the Knicks need to make sure they get back on defense and force the Rockets to beat them in the half-court game. As we saw when he played in New York, Lin is susceptible to turnovers in the half court and could allow the Knicks to get out into their own fast breaks. Keeping Omer Asik in check tonight will fall on Tyson Chandler. Asik killed the Knicks last meeting with 18 and 14, and is averaging over 11 boards a game on the season. With Rasheed Wallace likely out again, Chandler’s interior defense and rebounding will be essential to limiting Asik’s effectiveness. Tonight will mark the return of another former Knick point guard, Toney Douglas. Douglas played well for a brief time a couple years ago and was the Knicks starting point guard against the Celtics in the playoff series, but seemed to regress significantly last season. Douglas was a part of the deal that brought Marcus Camby back to the Knicks, and has played pretty well for the Rockets this season. He is averaging over 10 points per game over his last 10 games in 22+ minutes. The hard-working point guard was pretty much ran out of New York at the end of last season, and has found a decent fit with the Rockets. This is a huge game for the Knicks even without the return of Jeremy Lin. That is the last thing on the Knicks’ minds as they want to avenge their worst loss of the season. Raymond Felton told reporters this morning that they owe the Rockets something, and I expect them to come out firing at the World’s Most Famous Arena.